The tour is the third in a series of Seedstock ‘Future of Food’ field trips that was recently launched to facilitate the exploration of food system innovations that are generating economic and community capital. Early Bird Discount Tickets are available for a limited time, so grab your tickets before it’s too late! 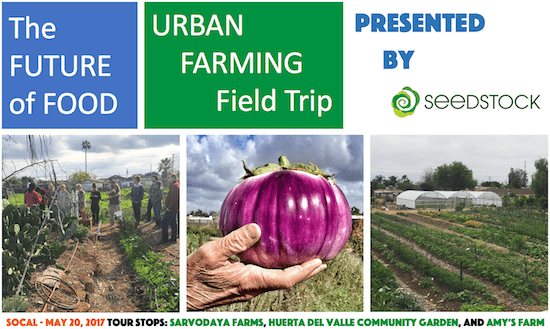 Sarvodaya Farms is the educational, community-based urban farming initiative of The Growing Club, based in the Pomona Valley of California. Through this initiative, The Growing Club seeks to demonstrate how urban farms can be centers of social, economic, and ecological regeneration and healing in (sub)urban centers. The farm’s goal is to educate the community about regenerative urban farming through its farmer training program, community events, and workshops. 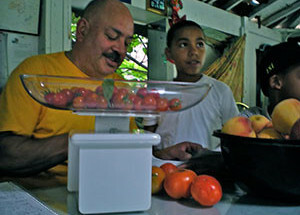 Huerta del Valle operates a 62 family community garden and 2.5 acre urban farm in Ontario. 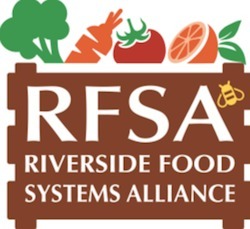 Its mission is to create healthy food access for low-income community members, create community empowerment through food, create job opportunities and educate community members about sustainable agriculture. Huerta’s overarching goal is to provide all 160,000 people in the city of Ontario with accessible organic food. Amy’s Farm is a real, working polycultural farm focusing on sustainable, organic methods to farming. The farm provides fresh produce to the local community and offers education with hands-on, guided tours to visitors of all ages through its educational 501c3 non-profit organization. Amy’s Farm was founded in an effort to provide residents of San Bernardino, Orange, Riverside and Los Angeles Counties and surrounding areas the opportunity to visit and experience a true operating urban farm.